XEOMIN® (incobotulinumtoxinA) is a prescription injectable neuromodulator medication used to temporarily improve the appearance of moderate to severe frown lines between the eyebrows (glabellar lines) in adults. XEOMIN® contains botulinum toxin type A, a protein purified from the bacterium Clostridium botulinum. XEOMIN® works similarly to Botox®. When you squint or frown, the muscles between your brows contract, causing the skin to furrow and fold. Over time, as your skin ages and loses some of its elasticity, these repeated contractions can cause persistent frown lines. Botulinum toxin type A – the active ingredient in XEOMIN®- acts on nerve endings in muscles to prevent muscle fibers from contracting. By reducing these contractions, XEOMIN® can temporarily reduce the lines on your forehead between your brows. XEOMIN® was proven effective in two randomized, double-blind, multicenter, placebo-controlled clinical trials of 547 healthy, adult patients. The average age of patients in the study was 46 years. Patients received 20 Units of XEOMIN® and were classified as responders if they had a 2-grade improvement on a 4-point scale as assessed by the physician and patient. Using these criteria, treatment success was higher with XEOMIN® than placebo on Day 30 in both studies (60% and 48% vs. 0% for placebo in both studies). Based on these trials, XEOMIN® received FDA approval for aesthetic use in 2011. 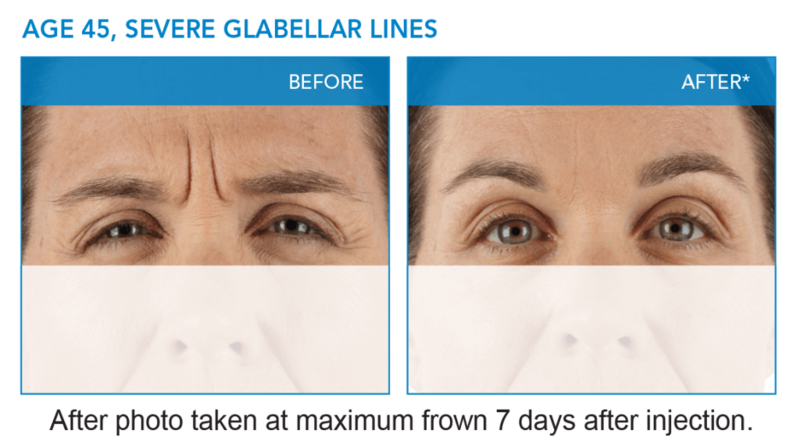 If you are an adult with moderate to severe glabellar lines, XEOMIN® may be right for you. Do not take XEOMIN® if you are allergic to botulinum toxin or any of the other ingredients in XEOMIN®. You should also not take XEOMIN® if you have had an allergic reaction to any other botulinum toxin product or have a skin infection at the planned injection site. During treatment, which usually takes about 10-20 minutes, Dr. Vendetti will inject XEOMIN® into the muscles in your forehead that cause frown lines between your brows. No anesthesia is required; however, we offer a topical anesthetic or cold pack to reduce any discomfort. Some patients observe visible smoothing as early as 3-4 days after injection. The first onset of effect occurs less than a week. The maximum effect typically occurs at 30 days. The typical duration of effect is up to 3 months, but may last significantly longer or shorter in individual patients. After the procedure, patients may experience slight bruising around the area that quickly fades. Normal activities can be performed immediately. Possible side effects may involve temporary weakness of nearby muscles, or, in rare cases, an eyelid may droop. XEOMIN® is completely reversible, so any side effect is only a temporary condition. Dr. Vendetti will explain all risks associated at the time of your consultation.